We congratulate Jana Kohn for receiving the Kekulé Fellowship of the VCI for two years. She will work on an enzyme-free route towards synthetic mussel-inspired polymers. Background: A 2-dimensional high-throughput screening method is presented to select peptide sequences from large peptide libraries for precision formulation additives, having a high capacity to specifically host a drug of interest and provide tailored drug release properties. 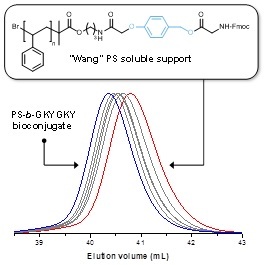 The identified sequences are conjugated with poly(ethylene glycol) (PEG) to obtain peptide-PEG conjugates that proved to be valuable as solubilizers for small organic molecule drugs to overcome limitations of poor water-solubility and low bio-availability. 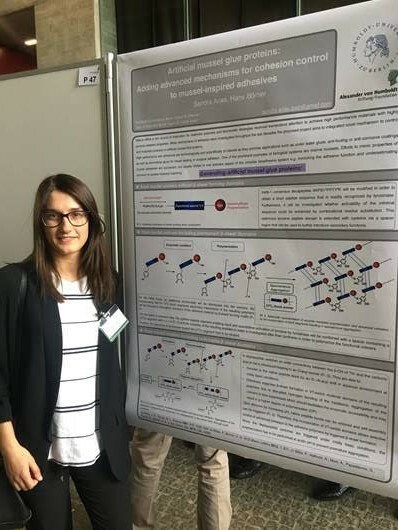 Dr. Sandra Arias has joined the group with an Alexander von Humboldt Fellowship for Postdoctoral Researchers for two years to work in Mussel-inspired adhesives by switchable β-sheet segments. Congratulations! 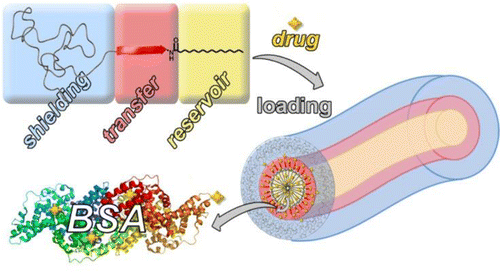 New Paper in ACS Biomaterials Science & Engineering has been published. Background: Collagen, processed into several morphologies and originating from various sources, has long since been used as a biocompatible material that can assist wound healing and tissue regeneration. 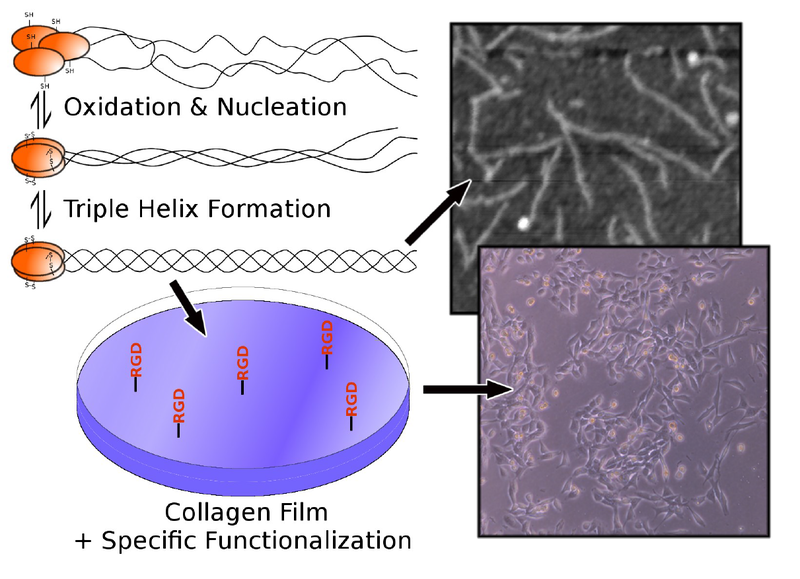 With the advent of biotechnology and solidphase peptide synthesis, new possibilities arise to create rationally designed biomaterials based on collagen sequences incorporating new functionalities whilst maintaining the beneficial properties of natural collagen. In this study a new class of synthetic collagen materials is presented, defined by its simplistic core structure and its therefore predictable behavior. New Paper in Macromolecular Rapid Communications has been published. Background: A straightforward access route to multifunctional block copolymers, combining a poly(ethylene glycol) (PEG) block and a monodisperse segment with discrete monomer sequence based on thiolactone chemistry, is described. Exploiting an inverse conjugation strategy on a PEG preloaded poly(styrene) synthesis resin enables the convenient introduction of a predefined PEG-block at the α-terminus of thiolactone-based sequence-defined oligomers. New Review paper in Macromolecular Rapid Communications has been published. Background: Peptide sciences developed dramatically as a result of routine use of solidphase peptide synthesis and nowadays offer a rich set of well-established strategies to design and identify functional peptide sequences for advanced applications in materials sciences. 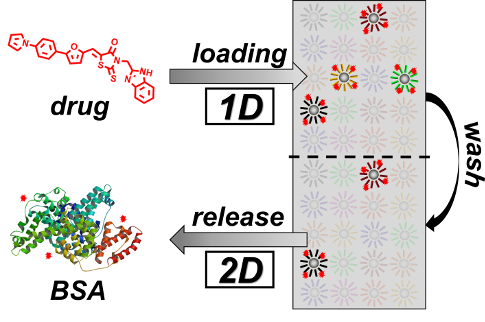 Appropriate sequences for a wide range of interesting material targets, ranging from molecules to materials surfaces and internal interfaces, can be selected via combinatorial means, and sequence specificities within the resulting peptide–target interactions can be routinely investigated. Based on this understanding, macromolecular sciences can define new polymer structures that meet required functionalities or functional sequences with fully synthetic, nonpeptidic precision polymers to endeavor toward information-based design of next-generation, purpose-adapted macromolecules. New Paper in Bioconjugate Chemistry has been published. Background: Tailor-made drug solubilizers are studied based on peptide-poly(ethylene glycol) conjugates, which exhibit peptide segments constituting binding motifs for the small-molecule drugs of interest to render them water-soluble. Suitable 7mer peptides are selected via combinatorial means by screening large one-bead-one-compound (OBOC) peptide libraries. The capability of the screening method to read out structural detail of the drugs is investigated by comparing three related photosensitizers (Chlorin E6 (Ce6), Pheophorbide A (Pba) and meta-tetra(hydroxyphenyl)chlorin (m-THPC), which are applicable for photodynamic cancer therapy. New Paper in Current Alzheimer Research has been published. Background: Anti-aggregation drugs play an important role in therapeutic approaches for Alzheimer’s disease. We have previously developed a number of compounds that are able to inhibit the pathological aggregation of Tau protein. One common obstacle to application is the limited penetration across the plasma membranes into cells, where Tau aggregation occurs in the cytosol. We used an inducible N2a cell line which expresses the repeat domain of tau and develops tau aggregates. A triazolinedione-precursor is directly built up from N-terminal peptide amine on resin enabling a versatile route towards peptide-polymer conjugates. CJ was rewarded the poster award of the SALSA Poster Session 2016. Congratulations! 14.10.2016 - Chapter 1: Synthetic Aspects of Peptide- and Protein-Polymer Conjugates in the Post-click Era. New book chapter in RSC Polymer Chemistry Series No. 22: Bio-inspired Polymers has been published. This book chapter will provide an insight into the chemical synthesis of peptide- and protein-polymer conjugates, ranging from classical synthetic reactions, to efficient bioorthogonal strategies, novel bioconjugation techniques and chemoenzymatic approaches. 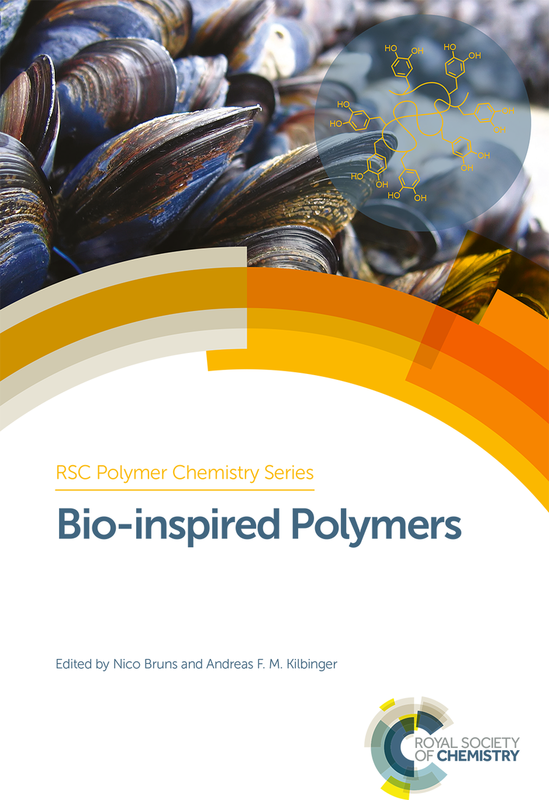 Against the background of bio-inspiration, the book will give a comprehensive review of novel polymer synthesis, adaptive composites and bio-mimetic surfaces. Diverse applications of bio-inspired polymers in fields such as tissue engineering, drug delivery, optical materials and many more are described. Stick to print: Selective coating of laser-printed patterns was achieved by material-specific adhesion of peptides to cellulose or toner. The peptide sequences were obtained using phage display. Functionalization of the immobilized peptides was realized by selective modification of tyrosine residues present on the printed-pattern coatings, offering new ways towards low-cost printed devices. 19.04.2016 - Enzyme-triggered antifouling coatings: switching bioconjugate adsorption via proteolytically cleavable interfering domains. New paper in ACS Macro Letters has been published. 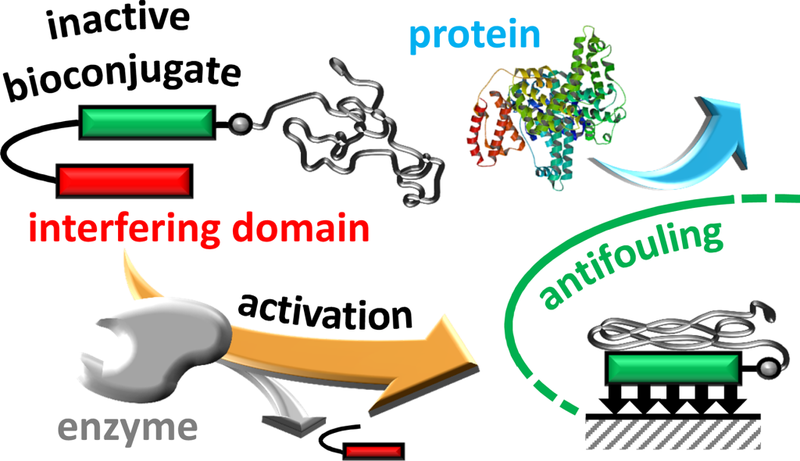 The enzymatic activation of non-adhesive peptide-polymer conjugates by proteoytic cleavage of suitable interfering domains results in stable surface coatings. An efficient reduction of protein/surface interactions is shown. 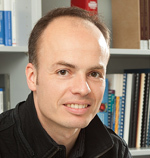 Felix Hanßke was rewarded a poster award. Congratulations! 08.06.2015 - Generic biocombinatorial strategy to select tailor-made stabilizers for sol-gel nanoparticle synthesis. New Paper in Small has been published. A generic route toward de novo design of tailor-made stabilizers for sol-gel nanoparticle synthesis is described. 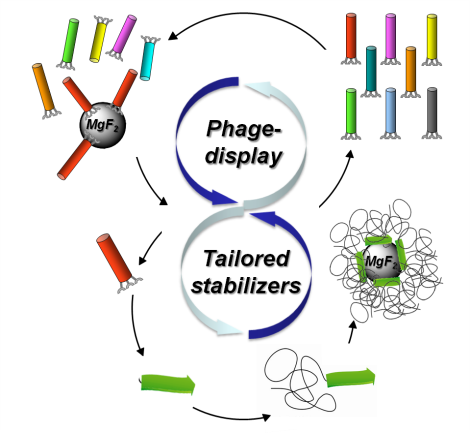 By exploiting phage display biopanning to select stabilizers from large peptide libraries, a significantly larger chemical space (~ 109 different compounds) is explored, compared to commonly used knowledge-based or empiric strategies. The approach is demonstrated on the fluorolytic sol-gel synthesis of MgF2 nanoparticles from Mg(OCH3)2 precursors. Peptide sequences are selected, showing sequence-specific adsorption onto MgF2 particle surfaces. 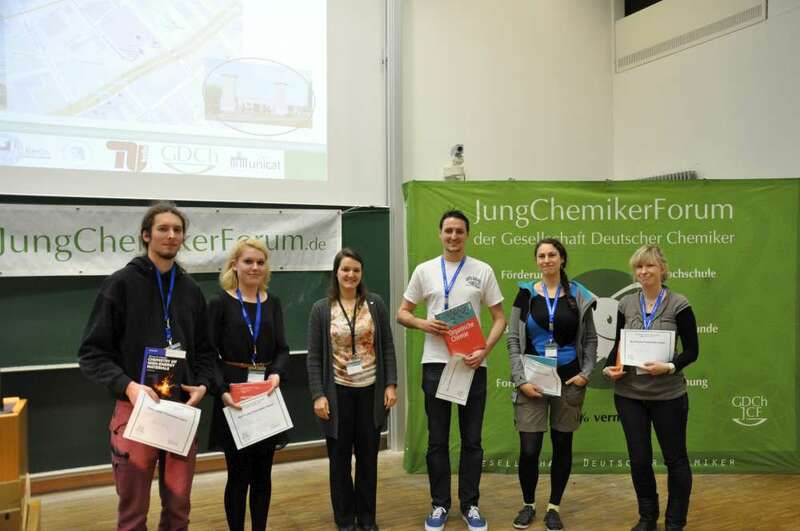 Felix Hanßke was rewarded the poster award of the BCS/EYCN Meeting 2015. Congratulations! 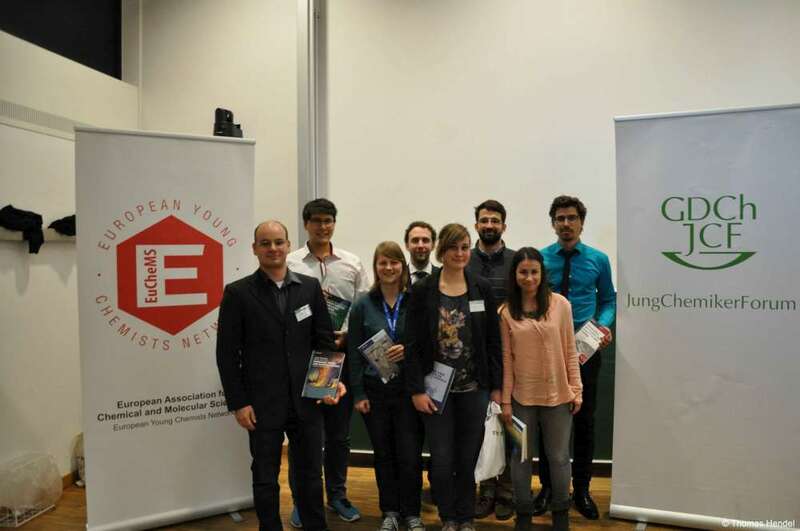 19.03.2015 - Synthesis of conjugates combining macromolecular brushes and rigid macrocycles. New Paper in Polymer has been published. On the occasion of the 65th birthday of Krzysztof Matyjaszewski (Link) a synthesis route to a conjugate comprised of two macromolecular brushes and a central shape persistent macrocycle utilizing ATRP is presented. As a result of the properties of the combined structure elements a functional macromolecule is obtained that regulates accessibility to a central shape persistent macrocycle via reversible brush-coil transitions. 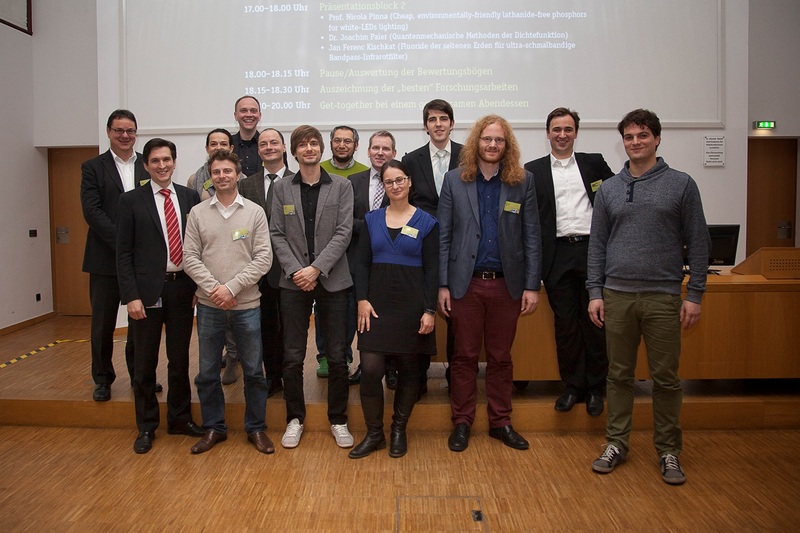 Innovation award 2014 from Humboldt Innovation in collaboration with Stiftung Industrieforschung for the presentation “Ein biokombinatorischer Ansatz zu aktivierbaren, muschelinspirierten Adhäsiven”. 01.09.2014 - A direct biocombinatorial strategy towards next generation, mussel-glue inspired saltwater adhesives. New Paper in Journal of the American Chemical Society has been published. Biological materials exhibit remarkable, purpose-adapted properties that provide source of inspiration for designing new materials to meet the requirements of future applications. For instance, marine mussels are able to attach to a broad spectrum of hard surfaces under hostile conditions. Controlling wet-adhesion of synthetic macromolecules by analogue processes promises to strongly impact materials sciences by offering advanced coatings, adhesives and glues. New Paper in European Polymer Journal has been published. 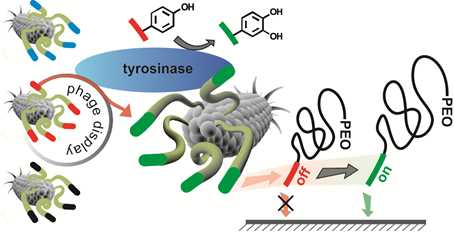 Peptide-polymer conjugates composed of a poly(ethylene oxide) (PEO) block and a precursor segment from mussel foot protein-1 (mefp-1) are enzymatically oxidized by tyrosinase. A functional transition from weak/reversible binders to strong/irreversible adsorption onto aluminum oxide surfaces is observed. To elucidate effects of PEO-block length on the enzyme activable formation of antifouling coatings on aluminum oxide surfaces, a set of mefp-1-block-PEO bioconjugates with PEO-block lengths of 850, 3200 and 5200 g/mol is synthesized and investigated. 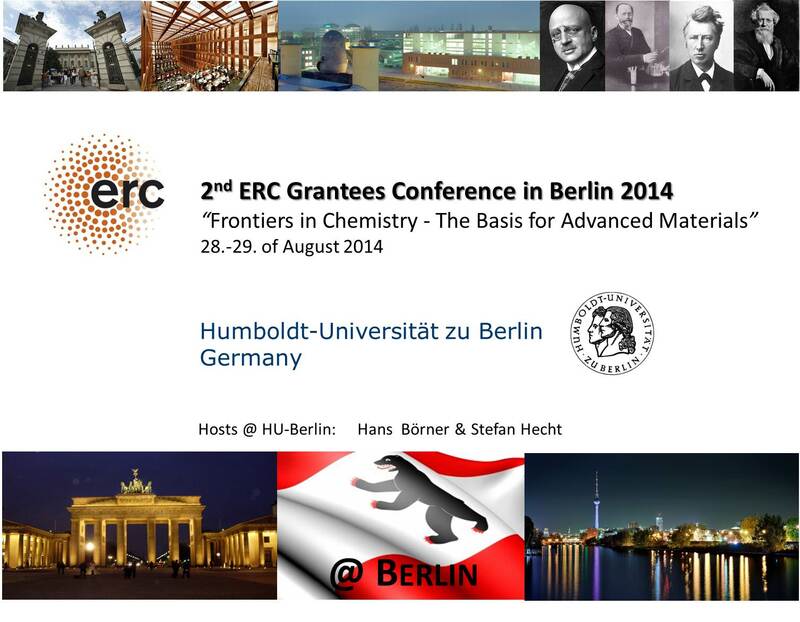 It is our great pleasure to invite you the 2nd European meeting of ERC grantees in chemistry to be held in Berlin on August 28 & 29, 2014. 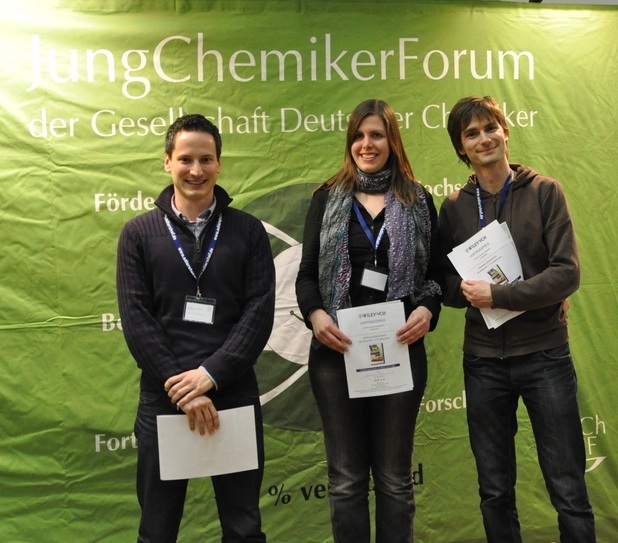 The meeting Frontiers of Chemistry continues a tradition started in Strasbourg two years ago. The aim of the conference is to gather some of the leading European experts in the field of chemical materials research, showcase their latest achievements, and discuss about future trends. 25.05.2014 - J.-F. Lutz (Institut Charles Sadron, UPR22 CNRS, Strasbourg) and H. G. Börner (Humboldt-Universität zu Berlin, Berlin) organized the EUPOC 2014 on precision polymers. The objective of this conference will be to discuss a new side of macromolecular research: “Precision Polymers”. In particular, this conference will highlight new directions in polymer synthesis. Indeed, we believe that the polymer chemists of the 21st century have to explore options, which are beyond conventional macromolecular engineering. For instance, the control over polymer architectures is nowadays not a challenge anymore. Recent tools such as controlled radical polymerizations or “click” chemistry allow a fine control of polymer architectures. 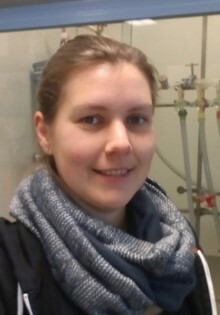 Congratulations to Laura Hartmann, who successfully defended her habilitation at the FU-Berlin and received a call to the W3 professor position at Heinrich Heine University of Düsseldorf (Nachfolge Ritter). We are very happy about the first academic offspring from the Börner Lab as Laura achieved her Ph.D. with us from 2004 to 2007. 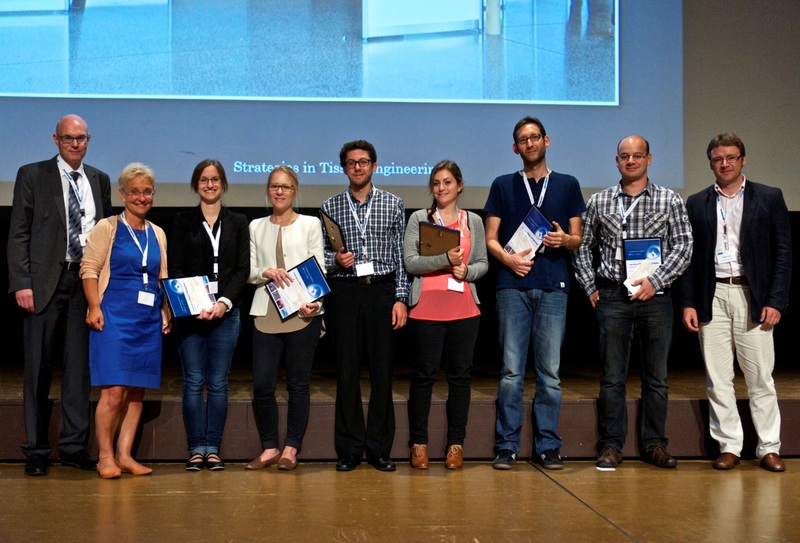 Steffi Große was rewarded the poster award of the BCS 2014. Congratulations! New Paper published in collaboration with Jean-François Lutz. 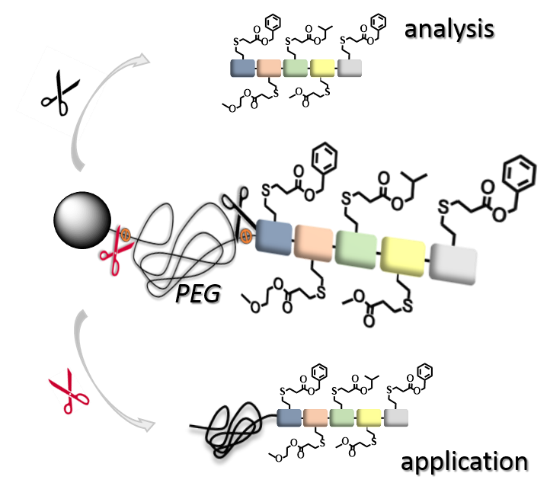 Oligomers containing the peptide sequence cysteine-anycysteine (CXC) were attached, at specific locations, to a linear chain of polystyrene. The polymer-bound peptide motifs were then oxidized in dilute conditions to afford a complex bio hybrid bi-cyclic topology via intramolecular twin disulfide bridge formation. "Revealing secrets of material specific peptide adhesion: From advanced NMR analysis to computational process modeling"
New Paper published in collaboration with Christopher Barner-Kowollik (KIT). A phencyclone derivative is used to achieve light-controlled immobilization of peptides possessing only natural amino acids. The photoactive precursor (blue in picture) is formed in a Diels–Alder reaction and can undergo light-triggered ring-opening reactions with amines. Successful surface patterning with a genuine c(RGDfK) peptide (green) is evidenced by imaging time-of-flight secondary-ion mass spectrometry (ToF-SIMS). Efficient routes to N-terminal PEGylated peptides are described. Alternative supports such as superparamagnetic core–shell nanoparticles as colloidal supports and end-functional poly(styrene) as homogeneous supports improve the available solid-phase supported coupling strategies preserving ease of purification. Poly(ethylene glycol) (PEG)–peptide bioconjugates are obtained in high yield despite the use of nearly stoichiometric PEGylation agents with respect to the supported peptides. A generic method describes advanced tailoring of polymer drug carriers based on polymer-block-peptides. 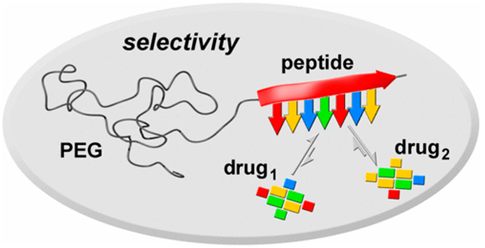 Combinatorial means are used to select suitable peptide segments to specifically complex small-molecule drugs. 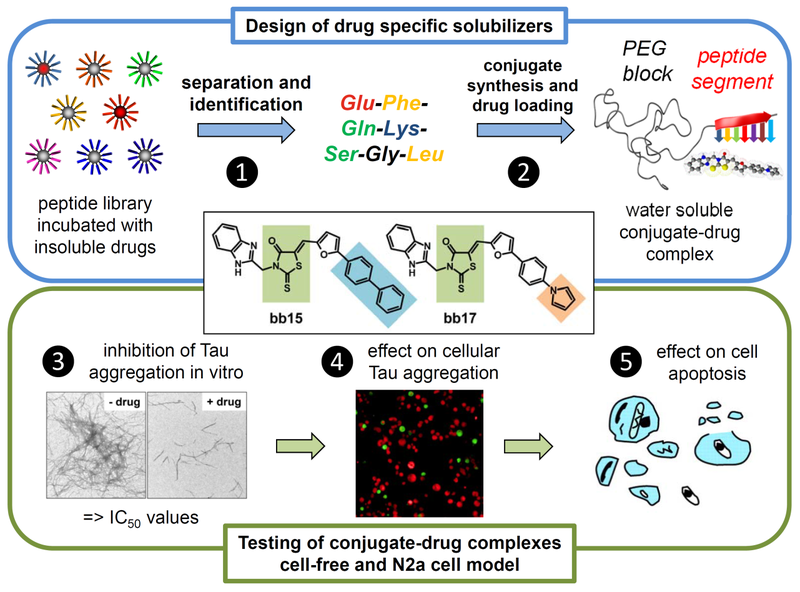 The resulting specific drug formulation agents render insoluble drugs water-soluble and enable precise adjustment of drug-release profiles beyond established block-copolymer carriers. Making light work of ligation: A novel method utilizes light for oxime ligation chemistry. 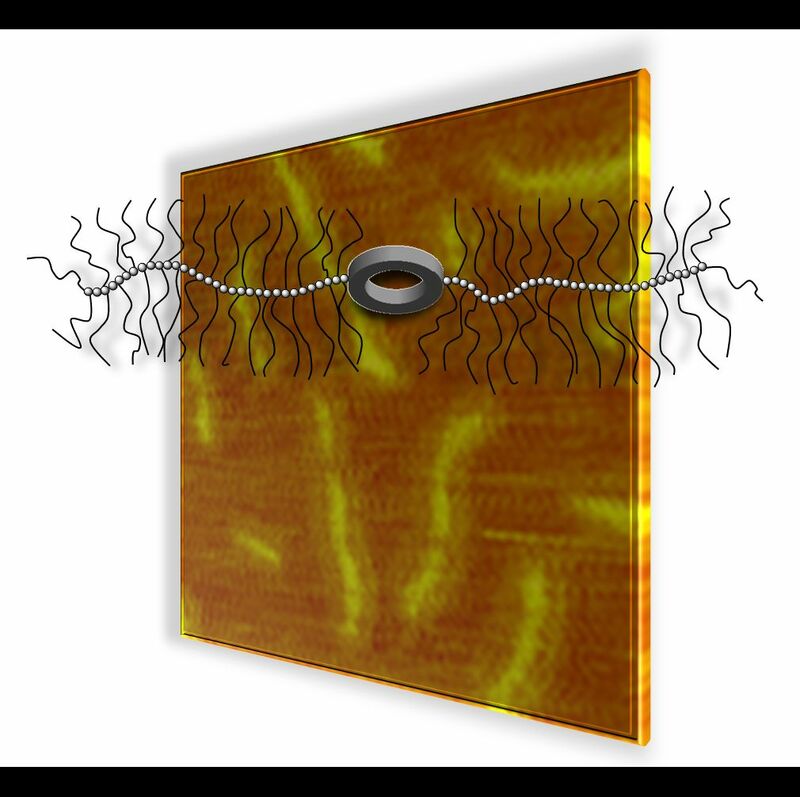 A quantitative, low-energy photodeprotection generates aldehyde which subsequently reacts with aminooxy moieties. The spatial control allows patterning on surfaces (see scheme) with a fluoro marker and GRGSGR peptide and can be imaged by time-of-flight secondary-ion mass spectrometry. Enzyme activated polymer coatings based on peptide-polymer conjugates are described. 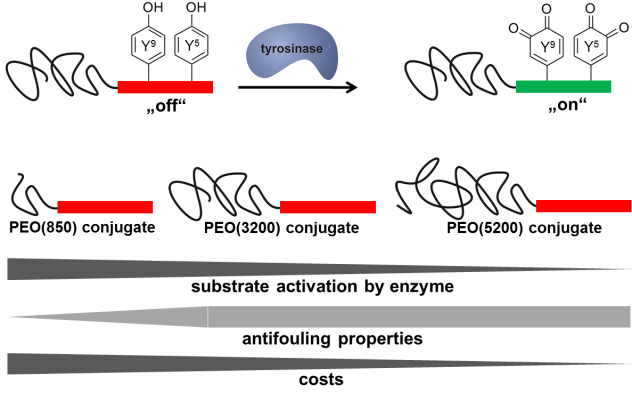 Tyrosinase is used to “switch on” adhesive functions of a mussel glue derived peptide segment, leading to bioconjugates that adhere to steel. The coating resists seawater treatments and modulates surface properties to anti-fouling surfaces by strongly reducing protein adsorption. New Paper in Chem. Commun. has been published. 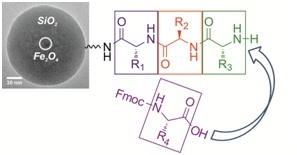 Magnetite nanoparticles are coated with a silica-shell and functionalized with amino groups to further introduce linkers moieties needed for peptide synthesis. The size of the colloidal supports of ~70 nm allows chemical peptide synthesis in “quasi solution”. An external magnetic field is used for magnetic sedimentation for ease of purification of the products after each reaction step. from the University of Cincinnati, USA. Sebastian Wieczorek: Price for the best Poster submitted Congratulations! Paper published in Chem. Commun. together with Dr. Jean-Francois Lutz (Strasbourg). Well-defined cleavable or non-cleavable soluble polystyrene supports were prepared by atom transfer radical polymerization and utilized for the iterative synthesis of functional hexapeptides. This approach allowed rapid and efficient liquid phase synthesis of peptide–polymer conjugates. 23.12.2011 - Peptide-mediated nanoengineering of inorganic particle surfaces: A general route toward surface functionalization via peptide adhesion domains. New Paper in JACS has been accepted. A one-step surface coating procedure is described. Coating is performed with peptide adhesion domains, found via phage display. This highly generalizable protocol permits various surface functionalization, which was shown by introduction of a fluorescent dye and PEGylation on Gadolinium oxide particles. A photoconjugation strategy based on light-triggered Diels–Alder addition of o-quinodimethanes is described. The method provides spatial control, is compatible with biomolecules, and proceeds rapidly at ambient temperature without the need of a catalyst. Bioconjugates combining PEO-functionalized peptide segments with covalently linked semiconducting alkylated quaterthiophene moieties are reported. Self-assembly and stimuli-responsiveness was investigated in a convergent experimental and computational approach. Der “Tag der Chemie” der Berliner Universitäten wird unter der Organisation des AK Börners an der HU-Berlin veranstaltet. Das diesjährige Motto “Studium....und dann?” soll zum Informationsaustausch zwischen Industrie und Universitäten anregen. Ausgewählte Beiträge beleuchten das Thema aus Sichtweisen namhafter Industrieunternehmen, Mittelständiger Unternehmen und Nachwuchsgruppen. Börner and Lutz edited a book on the topic of Bioactive Surfaces in the series of Advances in Polymer Science. Börner, H. G.; Lutz, J.-F., (Eds. ), "Bioactive Surfaces" In: Advances in Polymer Science,. Springer-Verlag: Berlin, Heidelberg, New York, 2011; Vol. 240. Paper to be published in Soft Matter A de novo designed calcium responsive peptide sequence was synthesized and the effect of conjugating poly (ethylene oxide) of different molecular weights on the calcium induced coil-to-helix transition was investigated. The secondary structure transition showed to be reversible upon addition of competitive calcium ion binders. Paper published in Angew. Chem. Int. Ed. Inter- and intramolecular Coulomb interactions of peptides are modulated leading to a biomimetic approach to reversibly regulate functions in peptide-polymer conjugates. As triggers to screen peptide charges and thereby switching the peptide secondary structure, calcium ions are exploited. This results in a reversible control mechanism for bioconjugate self-assembly. By regulating the Ca2+ levels using competitive Ca2+ binders disassembly is feasible. Peptide-block-polymer copolymers possess a monodisperse peptide segment with a freely programmable monomer sequence. An overview on the possibilities that arise from these precisely adjustable, functional polymers is presented. Polymer nanofiber meshes that possess biofunctional peptide segments on their surfaces are obtained with a standard electrospinning setup. Spinning a homogeneous mixture composed of a valuable polymer-peptide conjugate and a biocompatible commodity poly(ester) leads to nonwovens where the peptide part is enriched up to 11-times on the fiber surface. Bioavailability and bioactivity of the peptides are demonstrated as the meshes promote adhesion and migration of fibroblasts. 15.12.2010 - Merry X-mas - Wir wünschen allen frohe Weihnachten & ein erfolgreiches Jahr 2011! 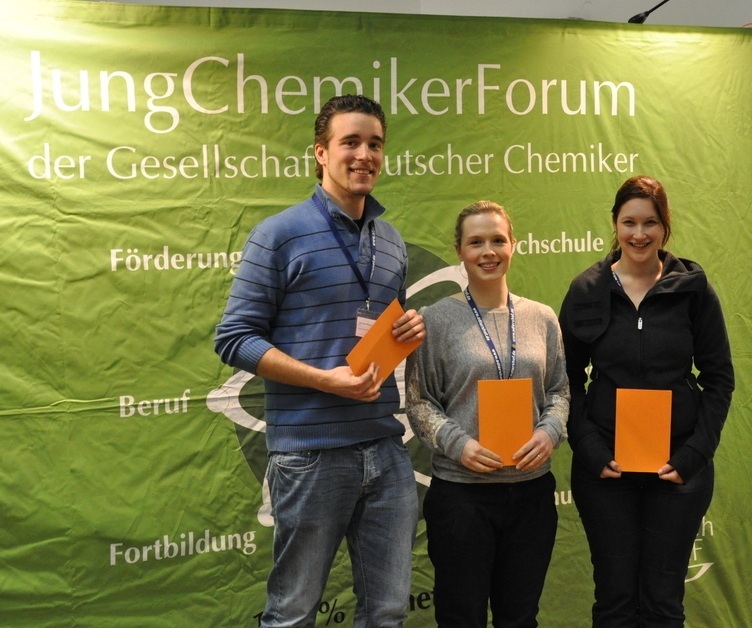 Christian Stutz vom Arbeitskreis Prof. Hans Börner der Humboldt-Universität zu Berlin wurde beim diesjährigen Sprechertreffen der JungChemiker in Würzburg in den Bundesvorstand des JungChemikerForums der Gesellschaft Deutscher Chemiker gewählt. Sein Ressourcengebiet umfasst die Öffentlichkeitsarbeit und Homepage des Forums. In a single step, polymer nanofibers with pentafluorophenyl (Pfp) activated esters at the surface are fabricated by electrospinning of either pure poly(pentafluorophenyl methacrylate) (PPfpMA) or PPfpMA / poly(ε-caprolactone) (PCL) blends which can be successfully functionalized with amino-functional biomolecules like saccharides for immune response. Self-assembled peptide–polymer nanotapes of poly(ethylene oxide)–peptide conjugates are modified by a simple amine–azide transfer to create azide-containing nanofibres, which provide a platform for modular functionalization as demonstrated by the introduction of different carboxyl bearing entities to modulate the calcium binding properties of the nanotapes.